As reported in the NY Times today, there’s a new Cambodian Cuisine food truck in the city. Jerry Ley, who had a Cambodian Cuisine restaurant in Fort Greene for 13 years and moved it to the Upper East Side a few years ago, has opened a food truck called Cambodian Cuisine Torsu. We’re not surprised he opened a food truck after the nightmare landlord and construction stories he tells on the website. They make police harassment and parking tickets look like a walk in the park. We haven’t tried them yet, but it looks like they have been mostly parking around the Village, which is our neighborhood, so it should be fairly easy to stop by. We have added Cambodian Cuisine Torsu to our Mobile Munchies twitter list, but you can follow them yourself on twitter here. 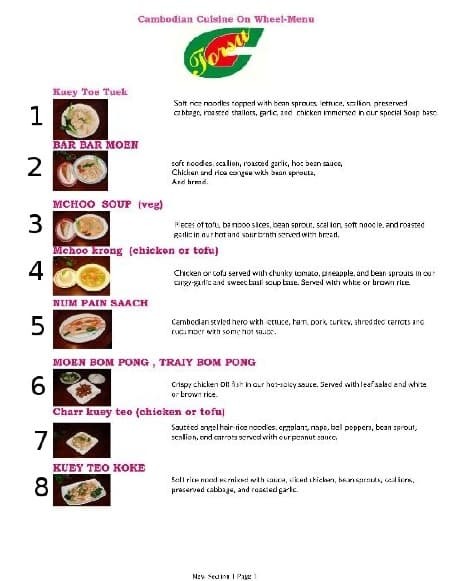 The Cambodian Cuisine website is here, and pages 1 & 2 of the trucks menu can be found here and here. Sorry about the menu’s print, but that’s how it is on their website. We will try to rectify that after visiting the truck.